This mountain ridge trail connects Maunalei Arboretum to the heart of Kapalua Resort. Offering spectacular views of Mokupe‘a and Honokahua Gulches, this trail allows hikers to walk through rugged land once used to cultivate coffee and pineapple during the Honolua Ranch era. 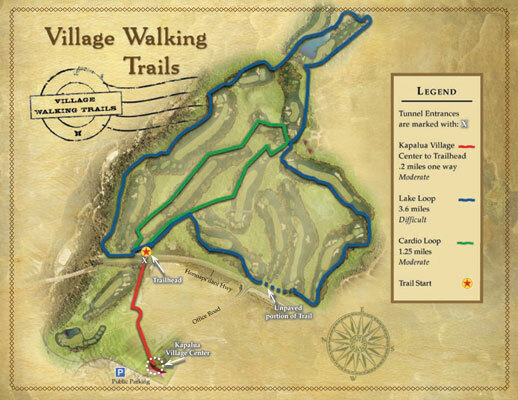 The trail is accessible from the Kapalua Village Center or D.T. Flemings Beach. Please note that it is a strenuous 20 plus-mile roundtrip hike to the trailhead so hikers are advised to dress appropriately, carry adequate water and nutrition and be mindful of hazardous weather conditions. 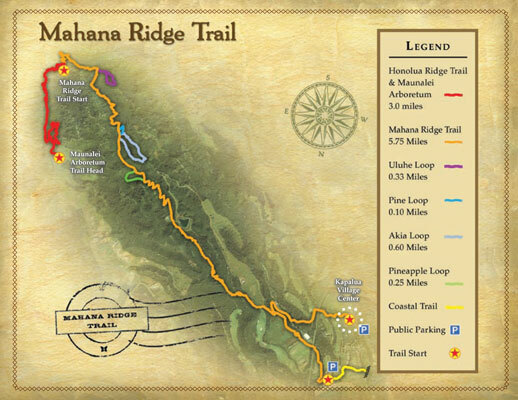 No return transportation from the trailhead above Plantation Estates and Honolua Ridge will be provided. No private vehicles are permitted to drive to the trailhead as the roadway is private property with no public access allowed. A network of walking trails follows the established cart path located on the former Village Golf Course. Stunning panoramic views and a hidden lake stocked with ducks await those who venture to the top of the course. The Village Walking Trails are open on a temporary basis and are subject to closure at any time without notice. 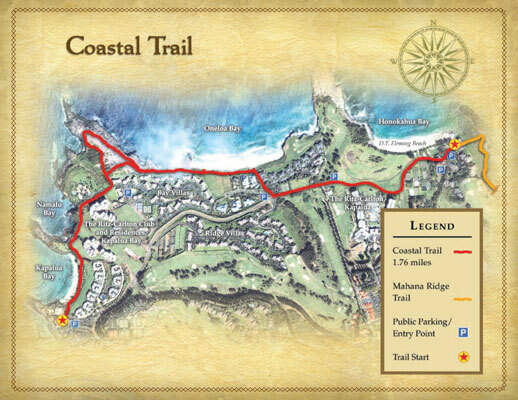 At the ocean's edge throughout Kapalua Resort, the Coastal Trail runs north from Kapalua Bay Beach, across the sand dunes at Oneloa bay, through the Ritz-Carlton, Kapalua to popular D.T.Fleming Beach Park.